Another early start after a surprisingly good sleep in the hammock, everyone was pleasantly surprised by how comfortable they were in their hammocks and they slept well! It was just getting light at 6am as we drank our early morning tea/coffee, we then walked a few meters to the landing stage on the river. 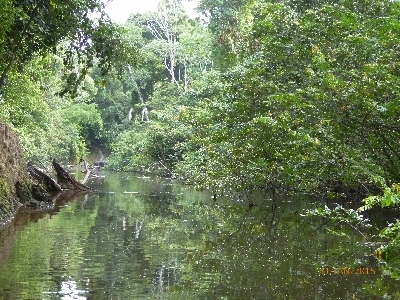 The Burra Burra is a small tributary of the much larger Esquibo River, it runs through the forest in a deep and often narrow cutting, many fallen trees form all kinds of obstacles and hazards for the boatman. The river provides a vital link to several villages and is also provides a good source of food, ie. Fish. The water level was quite low so we had to go down river after we all boarded a 12 seater powered-boat. A Cocoi Heron was our first sighting quickly followed by an Amazon Kingfisher, we drifted with the flow of the river as Gary and Luke, our two guides sat at ‘pointy-end’ of the boat calling out all the birds. It was a fantastic trip the whole group were thrilled by the experience, the closeness to nature and solitude of the river was spell-binding. We had a superb couple of hours with some super sightings, tiny Long-nosed River Bats clung to the underside of fallen trees, freshwater Stingrays swam below us and birds were everywhere, the skilled boatman was able to manoeuvre us close to the bank whenever we made a sighting. Blue Crowned Motmot was nice to see as was Green-tailed Jacamar, various parrots squawked high above us and many wrens and Antbirds trilled or warbled in the thickets. In one place we listed four different Antbirds: Silvered Antbird, we had excellent views of this hard to see species, the other three were White-browed, Black-chinned and Rufous-throated Antbirds. Then great excitement erupted on the boat as Gary shouted out “Harpy Eagle”, we saw this huge bird fly from a tree and disappear round a bend in the river. We manoeuvred the boat silently and slowly around the bend and found the eagle perched high in a tree, we had a fantastic 10-minute encounter with this almost mythical beast, the cameras never stopped clicking, what an experience, wow! After that everything seemed anticlimactic we did see a freshwater Stingray, a Green-tailed Jacamar, White-banded Swallows and lots of River Bats but nothing could touch the thrill of seeing the Eagle. After a lovely breakfast we set off walking back to Surama ECO Lodge, we birded the forest track, seeing a few species and adding Cinereous Mourner and Buff-cheeked Greenlet to the list. In the savannah near the lodge a couple of the group saw a Lined Seedeater. Well, our short time at Surama was over, after another lovely lunch we set off for Rockview Lodge which is found deeper in the Rupununi Savannah where we are due to stay for 3 nights. The journey was in the Bedford Truck and was pretty much uneventful, the road was in good shape and we soon arrived, we had a very warm welcome at Rockview Lodge when we arrived from the staff and Colin the eccentric and charming owner. After settling in and drinking tea/coffee on the terrace of the restaurant we set off for an ‘Orientation’ walk led by Hendrix the resident bird guide. A few ‘hummers’ fed on the large number of flowering plants we saw: Glittering Throated Emerald, White-chested Emerald and Sooty-capped Hermit. 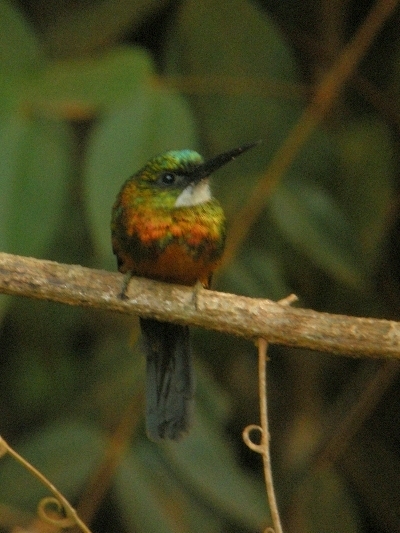 The walk produced a number of new species, Vermillion Flycatcher was the star, what a stunning looking species. We also saw Yellow Oriole, Orange-backed Troupial, Common Tody Flycatcher, Buff-burnished Tanager, Bare-eyed Thrush, Mouse–coloured Tyrannulet, Yellow-bellied Eleania, Fork-tailed Flycatcher and Buff-necked Ibis. Rum-punch was served before dinner, everyone began to relax and enjoy the laid-back ambiance of the lodge, the meal was superb cooked with local produce, including the fish. 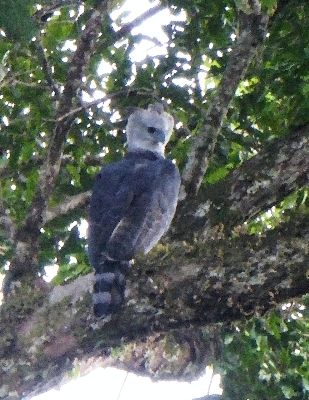 We got to bed very late at 9:30pm after calling the bird log, the Harpy Eagle got a cheer when I read it out.